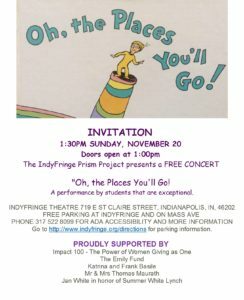 The IndyFringe Prism Project is presenting a free concert on Sunday, November 20, at 1:30pm. The Prism Project is a performing arts curriculum promoting both inclusion and access to the arts for young people with special needs. The Prism Project was the recipient of a 2016 residual grant of $18,333, and is a collaboration between IndyFringe and Ball State University..
For more information about the concert and the Prism Project, go to http://www.indyfringe.org/prism. This entry was posted in Announcements, Impact 100 in the News, Previous Grant Winner News on November 11, 2016 by Impact 100 Indy.